Over the past few years I’ve become pretty fond of keeping Christmas simple. One big reason for this was that as a mom with chronic illness, I just couldn’t keep up with the expectations and I had to learn to find peace with what I could do. That first Christmas I couldn’t do much accept watch from the couch as my family put the tree up. I’ve come a long way since then but the holidays are different now. I try to avoid the holiday stress as much as I can. I don’t go all out on decorations, gifts and trying to get to every event in town. I’ve learned to scale back and try to focus on the spiritual side of the holiday season. An added bonus that I’ve noticed is that when I keep things simple, there’s simply more time to enjoy everything that this special time of year brings, no matter how i’m feeling. Think back on what Christmas was to you as you were growing up. 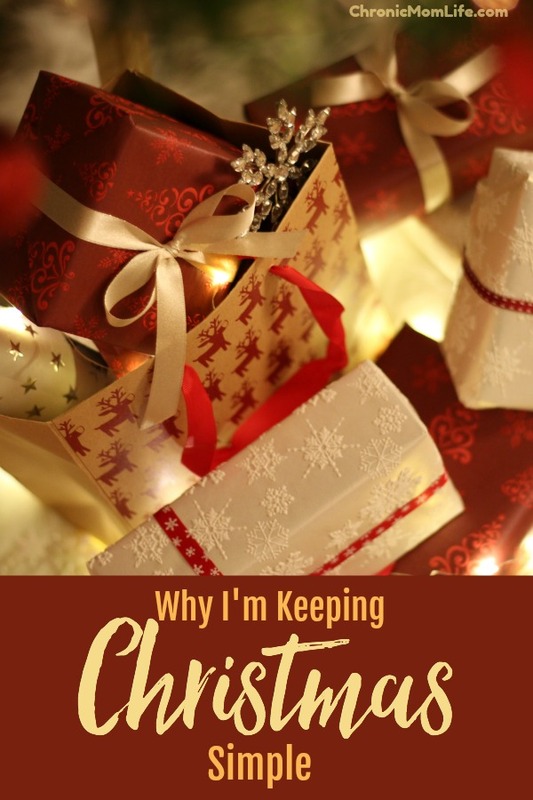 Chances are that the Christmas memories that mean the most might have been the ones where your family was financially struggling and didn’t have money for a lot of decorations and gifts. The sweetest memories can be made just by being together, and maybe making some simple crafts, decorating or watching the Hallmark channel. I’m on a never ending quest to simplify my life and after 25 years of family life, it’s still a work in progress. There’s still so much stuff to go through! I don’t buy too many decorations any more unless it’s something meaningful and high quality. I’m trying to sort through what we have and give away anything that I don’t love. This means less clutter, a house that’s easier to clean and a quicker January clean up. I’ve learned to keep the calendar light. Too much running around triggers my chronic illness symptoms and I think everyone gets more susceptible to illness. I try to pick just a few activities and events that our family can comfortably enjoy without breaking the bank. The rest of the holiday season we’ll just spend quietly together, baking cookies and watching our favorite holiday shows. When it comes to gifts, I say to each their own. I personally love having a surprise or two to open but in our family over the past few years Christmas often winds up being the time we upgrade our electronics. Truthfully, I don’t love this but that’s how it goes around here! I’m sharing this because in the blogosphere it’s easy to get caught up in what other families are doing and wanting to be like them but that often creates it’s own set of conflicts. Know yourself, your spouse and your family and do what’s right for you. I hope you’ll try keeping Christmas simple this year and see how much better you feel! If you’ve been following a Keto, Paleo, Trim Healthy Mama or any other low or controlled carb food plan, you’re probably very familiar with bulletproof, buttered or keto coffee. Bulletproof coffee is simply coffee that’s prepared with healthy fats such as MCT oil and grass fed ghee or butter. All you have to do is brew your coffee, add your fats, blend and then bottoms up! Bulletproof coffee provides a powerhouse of energy and that’s why it’s become so popular. I gave up traditional creamers months ago and make some form of bulletproof coffee every day. The folks at PowerCreamer reached out to me about reviewing their Omega Power Creamer. While it’s certainly easy enough to measure out the ghee and MCT oil at home, some people don’t want to be bothered with measuring and it’s certainly not a great option for the office. PowerCreamer is an excellent option for people on the go. It’s created with quality ingredients – grasped organic ghee, organic fair trade virtual coconut oil, MCT oil and sunflower lecithin. It’s sugar free, lactose free and casein free. And there’s no measuring or mess. I really loved using PowerCreamer and will plan to get it whenever I can. It’s a wonderful addition to your morning coffee and you can definitely taste the quality of the ingredients. Sometimes I also used a little bit in my oatmeal or cauliflower rice as well. Some people like to use it on their popcorn. PowerCreamer has generously offered my readers a discount code for 15% off all orders at PowerCreamer. You can also get it via Amazon Prime. Available flavors are Original, Vanilla and Cacao. This blog uses affiliate links. They do not affect the cost of the product for you, but I receive a small commission for recommending them. I only recommend products that I feel comfortable with and believe would benefit my readers. Thanks for your support! I started Trim Healthy Mama in January 2016. Although I didn’t do the plan 100%, I still lost about 25 lbs…pretty effortlessly. Unfortunately this year I got off track. I didn’t really gain anything (which is still a win!) but I was at a standstill smack in the middle of the decade I’d been all year. I reverted back to some old stress eating patterns. I set a goal to be at target weight by my 55th birthday in October but thanks to my meandering that isn’t going to happen. About a month ago I hit a low which was really a step backward. At the end of a trying weekend I decided I “deserved” some candy. Unable to make up my mind as to which one I wanted, I bought both (king size..mind you!) I put them in the bottom of the bag with plans to have some later when no one was watching. Of course, Someone is watching. And hey, I’m watching. I was embarrassed.This was while I was waiting to go into a recovery meeting and I’m acting out my addiction with candy. For some of us, food’s a drug. I only ate a bit and threw the rest away. I felt like crap. But this experience renewed the desire to to get things going again, and for the right reasons this time. I started reading Made to Crave (which had been sitting dormant on my tablet) and made a commitment to do a solid cardio workout three times a week. Four weeks later, I see a few lbs and inches gone but my metabolism is definitely showing it’s age. 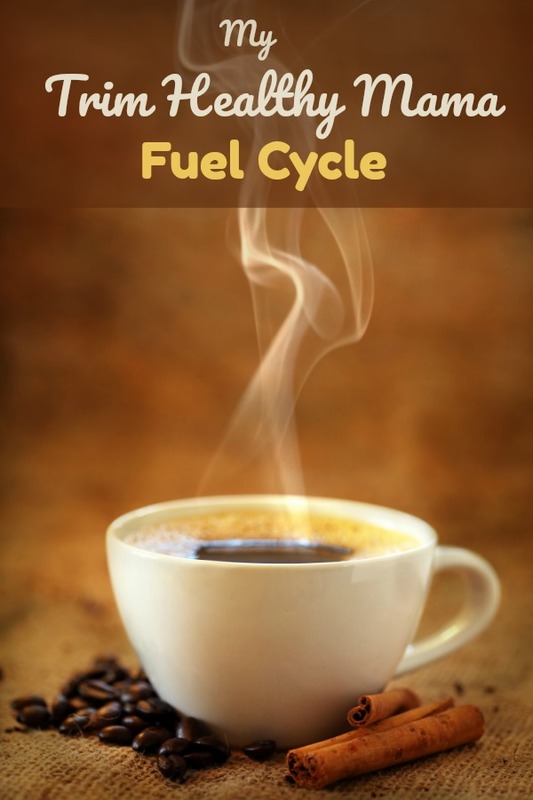 I decided to try the Trim Healthy Mama Fuel Cycle to reset myself. It’s a week or two of rotating meal types. My menu had two days of S, two days of E, two days of Fuel Pull and one day of Deep S but I’ve seen it where the third and fourth days were fuel pulls. My results? I didn’t see the big drop that others have but I did enter into a “decade” that I haven’t seen in well, at least a decade! I also feel it helped to wipe the slate clean and helped with food cravings. I know that going forward I need to incorporate more Deep S and Fuel Pull recipes into the mix. Also, I cut way back on cheese and didn’t die! If you’re new to Trim Healthy Mama and want to learn more, here’s the books that you’ll need. This is the NEW cookbook to be released in September 2017. I can’t wait! There will be recipes for the Instant Pot and a chapter of easy meals to throw together when you’re “hungry.” Also I was happy to find out they have a quick start plan included. At some point you do need to read this through. It is a bit chatty and overwhelming but it’s important to understand the science behind Trim Healthy Mama and be sure that you’re doing it right. If you put your mind to it, it can work for you and becomes second nature after awhile. This is the cookbook I’ve been using for 18 months. I wrecked the first one and luckily was gifted the next. As of this writing, I’m not sure how it compares with the new cookbook but I’ve certainly used it and found it useful. Finally, if you struggle with eating disorders (or just disordered eating) I highly recommend Made to Crave. This book has made a BIG difference in my journey. I also have the devotional which I refer to most days. As a fifty-something, I have a lifetime of broken habits built up and I’ll always need to be reminded. I’m feeling a little shellshocked about the many celebrity passings of 2016. Like many other kids from my generation, I grew up processing life through the music and comedy I listened to and the TV I watched. Struggling with constant conflicts with my biological family, and lacking any real extended family or faith community, I needed to feel part of something and I found it in 70s sitcoms and music. They were my family when I struggled with feeling loved and accepted in my own home. So when they inevitably pass away, it hits hard. It’s only natural that we’ll be hearing about more and more deaths of musicians and celebrities with every passing year. What gives me pause is that many of them aren’t too much older than me and in a few cases were even younger. While it saddens me and reminds me that time is indeed slipping into the future, it also makes me ponder how I really want to spend my time and what I want cut out what’s unnecessary. God willing, I’ll be 55 this year and my time on earth grows shorter. How can I redeem it and make it count? I’m spending a little time this Christmas break setting intentions for 2017. 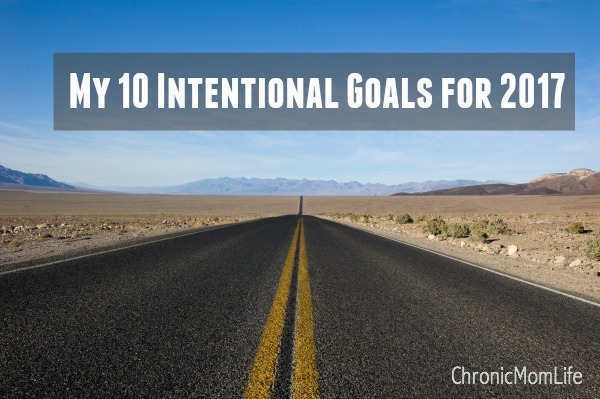 Intentional goals are a kind and gentle way of setting priorities. Read the Bible through. I’m embarrassed to admit that although I’ve been a Christian since 1988, there are some sections of the Old Testament I’ve never read and have never read it through as a whole. I’ve tried many times but got lost in Exodus and the business of life. I’m trying to do things a little differently this year. I found a plan that I think will be a good fit, and I’m going to make good use of the audio capabilities of YouVersion. I’m also using the Message translation because I just need a different voice. Resume health and wellness goals. I lost 25 lbs. In 2016, about halfway to goal. I probably could have gotten there sooner but I went off track quite a bit the second half of the year. I love yoga and am happy to do it most days but I need to add some cardio to the mix a few times a week because I lose weight faster when I sweat. Also I’m aiming to add two hot yoga sessions at the gym a week because as much as I don’t like the instructor’s style, it does push me past my limits and I feel great afterwards with reduced pain and spasm. Learn photography. It’s been a dream of mine to be a photographer for a long time but life always got in the way of my getting a DSLR or even having the time to learn. I’ve found a great photography course that I have already learned so much from. I’m kind of wondering if I’m really too old now to expect to go pro but it’s definitely a fulfilling and creative pastime for me. I’m also working on learning Photoshop with the hope of adding graphics and printables services to my business down the road. Reduce time spent on social media scrolling. I’m as hooked to my phone as anyone else and I spend far too much time randomly scrolling my social media feeds. It can really get in the way of productive reading. I just bought a Kindle paperwhite for this purpose so that I’d have something productive to read when in the car or sitting around waiting rooms. After this election season (and the sure to be ongoing drama in 2017…) I just find being online too much to be really draining. For me, there’s too much information to consume and process. I try to follow positive people for the most part but I can’t get away from the lingering sadness I feel when I see pics of people with big extended families or moms who aren’t chronically ill being able to do things with their kids that I can no longer do. Social media can be a blessing when it connects me with others who are struggling, gives me a writing outlet and a chance to earn a little extra money but it’s a curse when it triggers sadness and depression. Get outside. Chronic pain is a constant presence in my life that limits walking, which I used to love to do. I also hate the Florida heat and I find myself indoors far too much. One good thing about having an active Jack Russell terrier is that it does force me to get outside several times a day but I need to do more than than that. Pray. Somehow this fell by the wayside this year. I’ve been operating in “independence” mode all on my own strength. It’s a major character flaw of mine. I still want to be a badass New Yorker, but I often think God allowed me to become a disabled special needs mom so that I would see my powerlessness, learn to depend on Him more and see His provision in everything. Practice acceptance. Living with chronic pain has meant giving up a lot. It isn’t easy. I’m continually learning life lessons on accepting what I can’t change and the living the chronic life as best as I can. Practice gratitude. No matter how I’m feeling or what’s going on aroundme, there’s always something to be grateful for. Live one day at a time. I’m one of those big picture people who is constantly thinking what the next step is. That’s a given as a special needs mom…we tend to worry about the future more. We do have to plan ahead. But I have to learn not to overthink everything and accept each day and what it brings. Create margin in every area of my life. After 20 years of raising 4 kids, homeschooling and the household chaos that comes with being a special needs family, there is a whole lot of mess and clutter in every part of my house. Not sure if I should just tackle a draw at a time or attempt a program like this one (which might doom me to failure) or this one but every box taken out of the house and found drawer space is a victory. One more thing…I’d be remiss in not mentioning that I’m entering my 32nd year of sobriety. It’s still one day at a time. Living these intentions to the best of my ability will keep me in a good mindset which is essential to long term sobriety. P.S.I like to use my bullet journal to keep track of what I don’t do so that I don’t succumb to overwhelm and put too much on my plate. My friend Candace at Mercy is New likes to call these intentions Grace Goals. While everything seems possible during holiday or summer break, the reality of life WILL happen. Baby steps are all we really need to take and keep moving forward in grace with intention. Oh wait, there’s one more intention. I’ll be joining Candace’s community to study Woman of the Word in January. I really want to develop as a Christian writer and share the reason for my hope. That starts with more systemic study of the Bible. You can find more info here. One of the biggest struggles of following a healthy food plan during the holidays is when you get together with friends and loved ones. As much as you enjoy seeing them, you probably don’t want to fall off the wagon and possibly gain back some of the weight that you’ve worked so hard to lose or maintain this year. 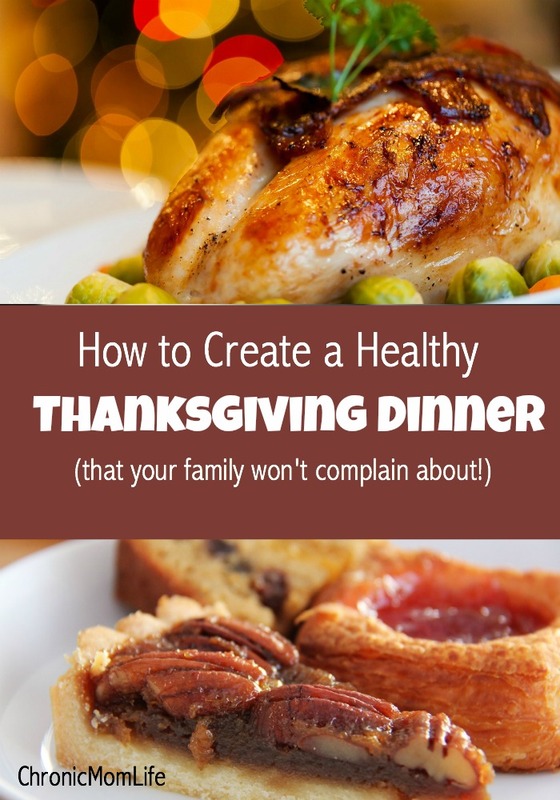 While it will take some extra planning, it’s quite possible to cook a healthy Thanksgiving dinner that everyone will enjoy. There are traditional Thanksgiving dishes that your non-whole food diet friends and family would be eating whether they were on your food plan or not. Make a list of these food items and be sure to include them on the list. Your family will already be familiar with these foods, so it will feel just like any other Thanksgiving dinner to them. The staples of any Thanksgiving dinner are typically turkey, and possibly ham or another meat. Traditional vegetables side dishes can include sweet potatoes, Brussel sprouts, corn and greens. This is already a great base for a Paleo or low carb diet. The next thing you can do when you are cooking a Thanksgiving meal for your family is to think of simple variations of the dishes your family will eat. There are quite a few different variations of familiar dishes that (may) keep them happy and will also be within the whole foods diet for you. However, you know your family and their tastes. If you know the following suggestions won’t work for your crew, make some variations for yourself ahead of time so that you don’t feel deprived. Make regular bread stuffing for your family and a cauliflower rice stuffing for yourself. You’ll start by making cauliflower rice by using a head of cauliflower that is put into the food processor (some stores like Target and Trader Joe’s offer pre-chopped cauliflower.) You mix in the same seasonings and vegetables that are in traditional stuffing so that it has the same flavors such as onion, celery, sage, basil, salt and pepper, and some poultry seasoning. This cauli-rice stuffing is easy to make and the final result looks just like regular stuffing. You can also make your own version of pumpkin pie for dessert. Instead of a regular crust, you will use chopped raw nuts along with dates and some cinnamon. The pumpkin pie filling is very similar to regular pumpkin pie, but with a few minor changes. Use some pumpkin puree along with honey, eggs, and coconut milk. You can also add in any spices you like. Pinterest is your friend here…search for Paleo (or gluten free) Thanksgiving ideas and you’ll get dozens of suggestions. For me, I’ve really learned to enjoy Paleo desserts with almond flour and coconut sugar and don’t miss the sugar and carb crashes at all. Let’s face it…Thanksgiving is all about food traditions. Some people might become really upset if the menu is completely different than what they look forward to! My own strategy here is to talk with my family beforehand to see what’s most important to them and make it. I know there’s enough Paleo and low/carb options that I can make a couple of things for myself so that I can enjoy dinner and not feel deprived. The most important thing is setting apart the day to be with your loved ones. So if you do wind up eating off-plan, remember that tomorrow is a new day and just get back on plan. Life can get downright overwhelming at times. How do you handle times of ongoing stress? Like Faydra Koenig mentions in her new blog post Living While in Personal Crisis it’s all too easy to succumb to the temptation of binge eating in yoga pants while numbing your mind on Netflix reruns. And you know what…that’s okay. For a little while. But when it starts to drag out for weeks or months, it’s time for you to take action. Don’t know where to start? 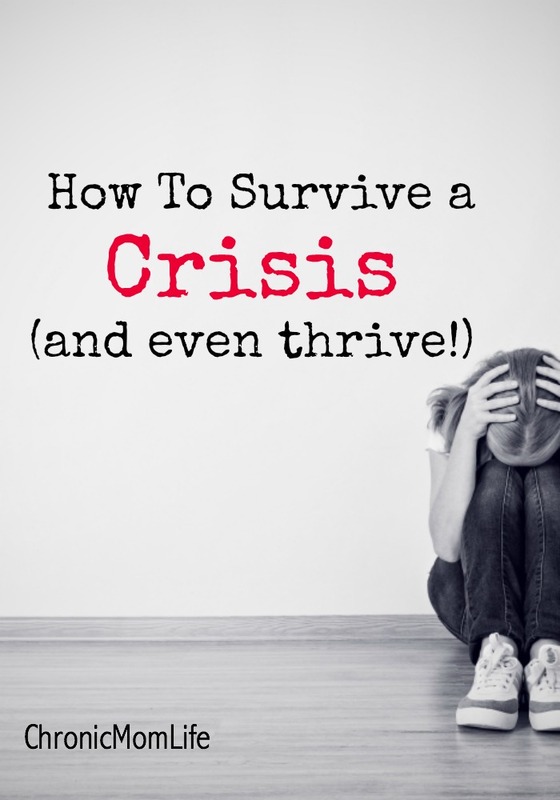 Living While in Personal Crisis gives you actionable steps to take so that you can start to feel alive again. She’s done the thinking for you. Crisis happens. You think I raised my hand and volunteered to hook myself to the scandal that hit my family? Ummmm, no. Emphatic NO! Did it happen anyway, yes. Sitting in my yoga pants, eating chips and dip (man I love chips and dip) was my silent middle-finger to my situation. Weathering my storm zapped my energy and for a moment I found sustenance in Reduced Fat Ruffles and this sour-cream-Ranch-dip-thing I like to make. (Don’t judge me, you jerk) After a while, the thought of mixing up the dip and going to the store for more chips felt like a misuse of my time. I started to want more. I wanted to stop going out to get chips and I wanted to go out and get a life. No one was coming over to moderate my chip intake and tell me that there was more to life. I had to find it for myself. I’m filing this one away on Pinterest for future reference. In our family, there’s always something around the corner…and I like chips too. Learn more about Faydra here. This election season is like none other I can remember in my lifetime (though truthfully I wasn’t always paying attention!) It seems like everybody is at each other’s throats and there is so much volatility that it’s tempting to just stay off social media. But on the other hand, the concerns being raised are complex and worthy of thoughtful engagement and discussion. How do you find a healthy balance? The old days when we got our news from the morning paper or evening news are over. Now we have a 24/7 news cycle. Blogging and social media give those with an inclination to write a natural outlet to express their thoughts. This is both good and bad. There are a lot of eloquent people out there worth following, while others are just spreading division. There is a lot of anger and hurt out there on a number of issues. People who have been stuffing their thoughts and feelings for years are finding healing in coming out of the shadows and voicing what happened to them. Social media has given a voice to the formerly voiceless. This is good and helps to bring awareness to important issues particularly discrimination which has impacted many of us. *Have you researched the information? Is it accurate? *Can you effectively handle the disagreement and ugliness that your post might trigger, no matter how heartfelt your intentions were when you wrote it? *Are you ready to spend a few days babysitting your Facebook thread so that it doesn’t get out of hand? *Are you ready to potentially be unfriended by people you’ve been FB friends for years? *Have you considered the ethnic and cultural diversity of your online friends who probably have had very different life experiences from you and are being triggered by the sensationalistic news headlines? Many people wonder if they should just turn it all off until after Election Day. But social media has become an integral way that many of us communicate with each other. And for those of us who are homebound, bloggers or work virtually, getting online is essential. It really is quite possible to do this and preserve your sanity. *Consider removing the Facebook app from your phone. *Set times to check Facebook and Twitter. Then stick with them. *When on Facebook, learn to walk away. Scroll on by without reacting. Don’t read comment threads. You don’t have to respond to every crazy opinion that’s out there. If certain topics are triggering you, unfollow the people who are posting them. *If you feel you must reply to an opinion, think carefully about it. Consider the source. Remember that most people will probably skim threads and really not read through that thoughtful response you just spent 10 minutes or more crafting and then type something thoughtless. *Filter your feed. I’ve found this to be a little harder on mobile but I’ve set notifications for bloggers and pages that I enjoy, read those first and try to resist random scrolling as much as possible. On my desktop, I can also just choose “Pages” feed. *Spend more time on Instagram or Pinterest. They’re happier places. *Stop scrolling period. Be intentional online and just check in with your close friends and favorite pages. And as much as you can, just turn everything off and go outside. You know, all of us should make more of an effort to engage with people in person instead of only online. Online communication can just magnify our differences. Try to meet and start conversations with people from different backgrounds who live in different neighborhoods and don’t vote or look like you. We should break bread and engage in meaningful conversation with each other and share our stories. We’ll probably find that we have a lot more in common with each other than we thought. I’ve also come to believe that sometimes we’re better off not knowing everyone’s political views. Online communication can put a strain or even destroy real life relationships. Those long, drawn out threads rarely change minds and often cause hard feelings. Think carefully before you post or reply. What Do You Do When Someone is Wrong On the Internet? Do you ever feel overwhelmed by healthy living and information overload? I completely get it. As a neurological patient, I’m passionate about discovering quality content, tools and resources to help improve my overall health and my goal is to share my findings with my you, my readers so you can reap those benefits for yourself. But as a busy mom with limited finances myself, I have to ask if the content is affordable, digestible and actionable. I don’t want this to wind up on your hard drive collecting virtual dust. 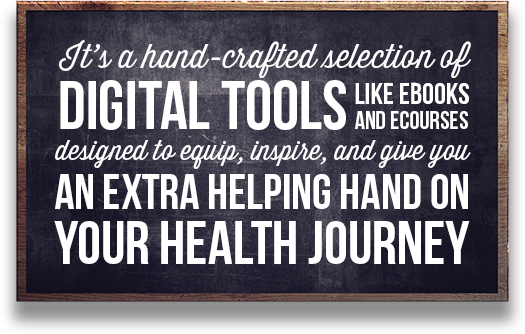 That’s why I’m happy to recommend the very popular Ultimate Healthy Living Bundle (now in it’s 5th year!) The creators are totally amazed at how many families are saying YES to their health (over 64,000 and counting!) and taking them up on this fantastic opportunity to get a complete library of natural living resources for a very low price. Believe me, I’ve had the same struggles and questions as you. What on earth do you eat? What do you feed your kids? How do you afford to buy healthier products? And where do you find the time and energy to make and do all this stuff? It’s not that you don’t understand or agree with why it matters. You’re sold on the merits of eating whole foods, raising healthier kids, avoiding toxins and chemicals, getting fit, and using alternative remedies. Don’t you ever wish someone would just show you exactly what you need to know and how to make these changes for less? Because when you have the right info and tools at your fingertips, it all comes together so much more easily. You’ll know what to cook for your family. You’re more confident in choosing natural alternatives. You find ways to save money without comprising on what’s important to you. You learn to replace store-bought products with DIY options that actually work and are easy to make. You feel better (and even look better, too). Healthy living becomes DOABLE. 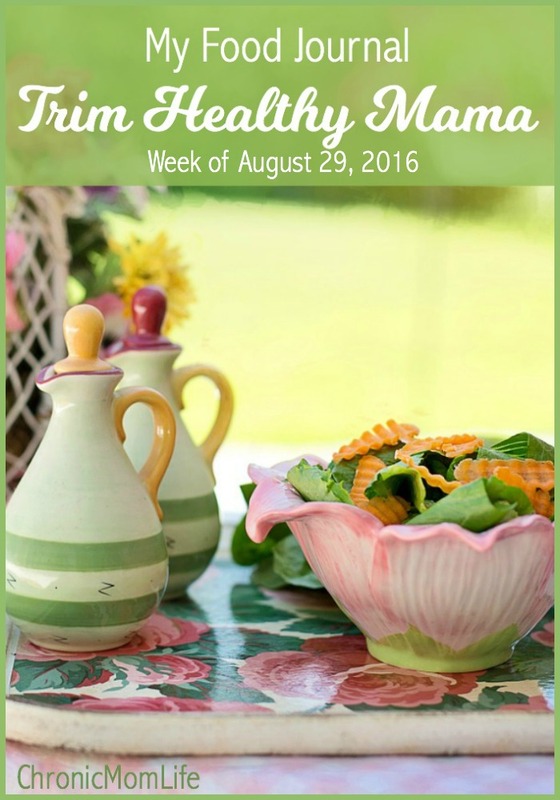 plus learn about gardening & homesteading, meal planning, weight loss and so much more! It’s an amazing deal but only available for a short time. At this price, the creators are able to give you access to over $2,400 worth of high-quality eBooks, eCourses and printables for a whopping 98% off! 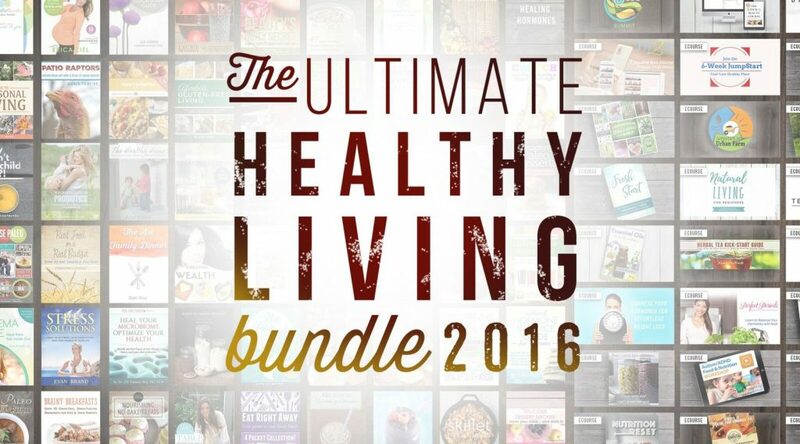 Visit Ultimate Healthy Living take a quick look at all the amazing resources that come in this package, then click the green “Buy now!” button to go through their simple and secure 3-step checkout process. Use their Getting Started Guide to pick the topic you want to tackle first and start making healthy changes! The most important detail, though, is that this bundle is available for just six days! After Monday night, September 26th, the sale ends and you’d have to buy all of these products individually. It’s even backed by a full money-back happiness guarantee, so you can make sure it’s right for you. No one should have to put off a healthier lifestyle because it costs too much or they can’t get the help they need. 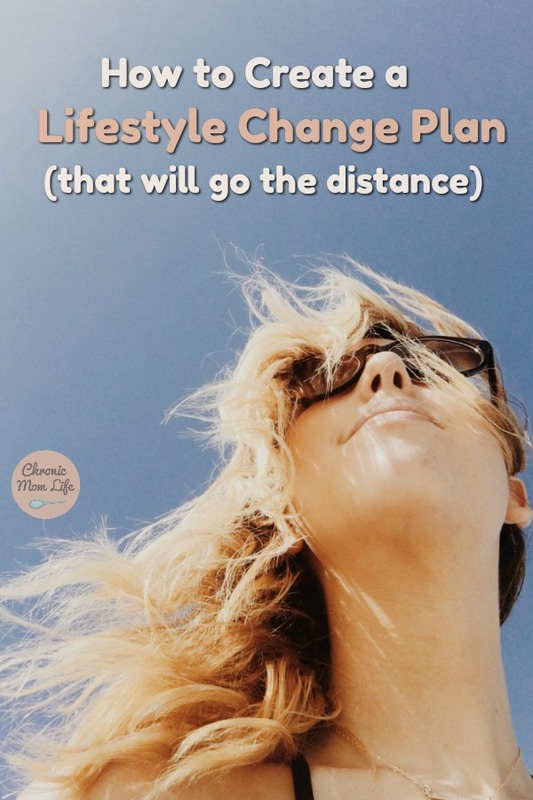 Making positive life style changes has been a major impact in the way I live with my chronic neurological condition, dystonia. When I feel good, I can handle what life throws at me and not get overwhelmed. It’s made all the difference in the world. I’m on a continual learning journey and I’d love to see the same for you. Sorry I missed last week’s post…I wasn’t too consistent in writing down everything I ate! I’m happy to report that I stayed on plan this week and am finding that the longer I truly follow Trim Healthy Mama, the more my cravings decrease. I still struggle with some cravings for afternoon crunch so we picked up some plain pork rinds this week. I also discovered Whisps (which I love) but until a Costco opens up in our area, they’re too expensive for me to get at Publix. We’ve been dealing with typical late summer Florida weather. Hermine kept us inside for several days. Luckily we haven’t had flooding in our yard. I do find that the heat totally kills my appetite and sometimes I just want something cold and sweet. Will try to tighten things up this week. I’m thankful that Trim Healthy Mama gives us the option for shakes and an occasional ice cream dinner! You’ll also notice that chocolate is one of my core food groups. This coming week I’m going to try to focus on drinking more water and doing some harder yoga workouts than I’ve been doing. I do drink GGMS most days. S – Ice cream (S) love Briana’s website! Many people make New Year’s resolutions to lose weight. They may experience some initial success on their chosen weight loss plans but fall off the wagon for one reason or another. They may have become frustrated with craving foods that were off limits. Or life got too busy and they couldn’t stay on the plan. Maybe they just gave up and resigned themselves to being overweight. A healthy life style means thinking for the long term, and that means creating a lifestyle change plan that works for you. This means looking at the big picture of your daily life, setting goals while living it out one day at a time. Diets are only a temporary solution to weight and health issues and inevitably don’t work unless ongoing lifestyle changes are made. Making small but smarter food choices every day for a year is better than an extreme diet that lasts a short time. It may take longer to see results, but when they come they will be long term. After years (or decades) of sugar addiction and other unhealthy food choices, it’s going to take time to retrain yourself to choose healthier options and for the weight and inches to come off. This is where committing to a long term healthy lifestyle is preferable to just going on the latest diet. This will really pay off for you in the long run. Make small changes daily. Find healthier substitutes for the foods that you crave. You might not think this will make a huge impact, but small changes over time will start to snowball. You may not even realize it yourself until someone comments on how great you look and wants to know how you did it! Remember, different strokes for different folks. Find what works for you and then just do it. We all have different physical needs, budgets and possible food sensitivities. The goal of a healthy lifestyle is to eat a nutritionally balanced diet that’s right for you. For most people the basics are getting enough fruits, vegetables, health protein sources and healthy fats while removing most processed foods from the diet. If you have a chronic condition or autoimmune disorder, do the research on your condition so you know what’s okay for you to consume. When you take a long term approach, weight loss will happen and your overall health will improve. Just give it time. In the meantime, if you find yourself on the scale constantly, you might want to hide it or just get it out of the house. Weigh yourself at the gym or when you go to the doctor. Little fluctuations on the scale can lead to discouragement and possibly a food binge. Find an exercise program that works for your ability and lifestyle. For some this will mean Crossfit or the gym. For others, it will be a simple walk, yoga or at home exercise. Don’t compare yourself with other women around you. Just do what’s right for you, be consistent and the change will happen. Track your lifestyle changes by taking measurements once a month and how your clothes are fitting. How are your energy levels? How does you skin look? These are all important milestones as you progress in your new approach to healthy living. As I’ve mentioned previously, Trim Healthy Mama has been a good fit for me as an overall lifestyle change. I tried various low carb diets over the years but always got frustrated within weeks or months because I was craving things like oatmeal, sandwiches and beans. Trim Healthy Mama lets you choose from a wide variety of foods while controlling carbohydrates and I really do feel pretty satisfied with it. It’s truly become a sustainable lifestyle for me but I do have my occasional struggles. Leslie Sansone – You can’t go wrong with her. I’ve always found her workouts to be very doable. Healthy Moving – I’ve used and loved Jen Hoffman’s yoga membership for the past few years. She’s revamped her program to a coaching and challenge program that’s accessible to anyone, especially busy moms. Do check it out…it is affordable and you might be able to be reimbursed by your insurance company. Jennifer is really knowledgeable about body mechanics, and she is a Certified Personal Trainer-Restorative Exercise Specialist (CPT-RES), a Registered Yoga Teacher (eRYT-500) with Yoga Alliance, a certified Restorative Yoga Teacher, has also completed prenatal yoga training. Hey there! My name's Marya & I'm a midlife special needs mom with several chronic illness diagnoses including cervical dystonia, ulcerative colitis and chronic fatigue. Living alcohol free since 1986, I share my best tips for radical self care including faith, yoga and journaling to help you thrive with chronic illness.